Robbie Brady makes Ireland's squad. Ireland will host Germany at the Aviva Stadium on Friday 12th October in their second game of their World Cup 2014 Group C Qualifying campaign. The “Boys in Green” had a very mixed start to their campaign. Ireland took all three points from their opening game away to Kazakhstan, however the manner in which the team played – and won the game – was far from impressive or even mediocre. There is very little surprise in Ireland’s 23-man squad. Giovanni Trapattoni has stuck to his guns and has kept his belief in the core group of players that he has dealt with since talking on the Irish job. A major loss for Ireland is the continuing absence of Aston Villa’s centre-back Richard Dunne. Ireland’s most reliable defender has been placed on the standby list, but it expected that Dunne will miss the German encounter after failing to return from a groin injury in time. 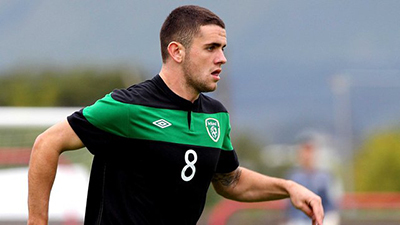 Another name on the standby list is Manchester United’s Robbie Brady. Because of his extremely impressive outing in his debut against Oman, the young United starlet he has made the top 23. Ireland have been hit with another injury set-back as Kevin Doyle is expected to miss the game at the Aviva Stadium due to a thigh injury. That leaves an Irish team that struggled up front in their opener, missing one of only two strikers – Robbie Keane being the other – that has hit double figures in international goals. Joachim Low will be delighted to welcome back the anchor of his midfield, Sebastian Schweinsteiger, who has been plagued by injury over the last 12 months. However, the German coach will be without Schalke’s Julian Draxler and Ilkay Gundogan of Borussia Dortmund. Both countries starting XI are quite predicable, but that is where the similarities end. Ironically Ireland’s best chance of taken anything from the Germany game is by using the very tactics that the Irish team and manager have been lambasted for using. The German’s are fair superior in technical ability and boast a solid back four and a team that, overall, is very disciplined and organised. Ireland’s only hope is to play tight and compact, be physical and to keep everything in front of them.